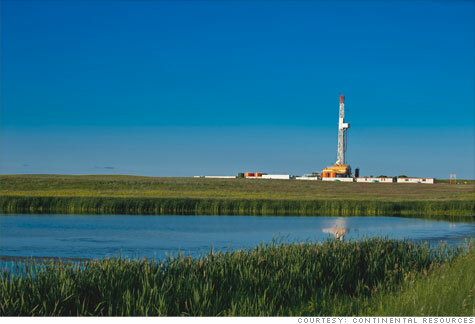 HOUSTON�(CNNMoney) -- In the grasslands of western North Dakota, one of the country's richest oil men is using a controversial gas drilling technology to develop what could be the biggest domestic oil discovery in the last 40 years. The oil lies underground in a shale rock formation stretching across western North Dakota, northeast Montana, and into Canada's Saskatchewan Province known as the Bakken. Thanks to hydraulic fracturing or "fracking" and high oil prices, oil production in the Bakken has exploded. It went from a mere 3,000 barrels a day in 2005 to 225,000 in 2010, according to the government's Energy Information Administration. EIA thinks it will produce 350,000 barrels a day by 2035, but most analysts think that estimate is far too low. According to Harold Hamm, president of the energy company Continental Resources, it could produce a million barrels a day by 2020. That's only a fraction of the 9.8 million barrels a day the country produces and an even smaller fraction of the 19.2 million it consumes, but it's significant. Forget $100 oil. $100 uranium is a real problem. "This is a giant field," said Hamm, a 65-year old self-made oil man whose parents were Oklahoma sharecroppers. Today, Hamm's wealth is estimated by Forbes to top $5 billion and he's thought to own more oil and gas than any other American. An American oil boom: Nationwide there are a handful of shale oil fields that could contain as much as 17 billion barrels of oil, according to a recent study from IHS CERA. That's more than the country's largest oil field, Alaska's Prudhoe Bay. "It's going to have a major impact on the United States reducing imports," Scott Sheffield, head of Pioneer Natural Resources Company, said Tuesday during a packed roundtable discussion on shale oil at CERA's annual energy conference in Houston. Sheffield estimates that with the new technology, the country could produce an extra 2 million barrels a day from both the Bakken and from shale oil trapped in existing traditional oil fields. "If we get 2 million barrels a day, that could have a major impact on world oil prices," said Guy Caruso, the former head of the EIA and now an advisor at the Center for Strategic and International Studies. The quarter-million barrels a day currently being produced from the Bakken is already partly responsible for the glut of oil seen in Cushing, Okla., one of the United States' main oil storage and distribution hubs. The glut has helped distort U.S. oil prices in relation to the worldwide market. It has also already contributed to a modest drop in foreign oil imports. North Dakota State University estimates the oil workforce has gone from just over 5,000 in 2005 to over 18,000 in 2009. Hamm said the industry now employs 30,000 in the state, and if production does hit a million barrels a day, it could employ over 100,000 people there. 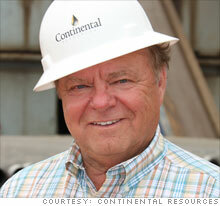 Hamm's company, Continental, is not the only one operating in the Bakken. Bakken challenges: Getting to a million barrels a day won't be easy, but it's already a lot of oil. And that contributes to one of the major challenges: Moving oil out. "There's not a market for all that oil in North Dakota," said Adam Sieminski, chief energy economist at Deutsche Bank. Pipelines will need to be built, and that takes time. Another challenge: Convincing the public the fracking technology is safe. Extracting oil from shale uses the same process as extracting gas from shale: Injecting massive amounts of water, sand and chemicals deep underground at high pressure to crack the rock and let the oil or gas flow. Many fear oil, gas or fracking chemicals could migrate up to the water supply. Many water wells have already been contaminated by the drilling process and fracking fluid spills. Disposal of used fracking material is another concern. It doesn't appear that these concerns, which have so far kept wide-scale fracking out of New York state, are as prevalent in North Dakota. "It's not drawing the same ire as it is in New York and Pennsylvania," said Jeremy Nichols, climate and energy director for the environmental group WildEarth Guardians. "But there are concerns." Hamm, like most in the oil industry, says fracking is a time-tested practice that poses no danger. He downplays the water issue in dry North Dakota and says his workers are developing ways to use less water. Even pipelines don't seem to be an issue. Hamm said he's moving most of his oil out by rail. For Hamm, the biggest challenge is simply the drilling. Getting a drill bit to go where you want it to at 10,000 feet underground is no easy feat. Finding qualified workers is also hard. This is all good news for workers in North Dakota and those trying to get the U.S. off foreign oil, but is an alarming development for people worried about the dangers of fracking.